Megan May Daalder’s Mirrorbox is a participatory sculptural installation and ongoing research project exploring states of temporary shared identity and the embodiment of empathy. The work resulted from the artist’s discovery that the visual experience of real time face morphing can produce an embodied sense of shared identity in two individuals. 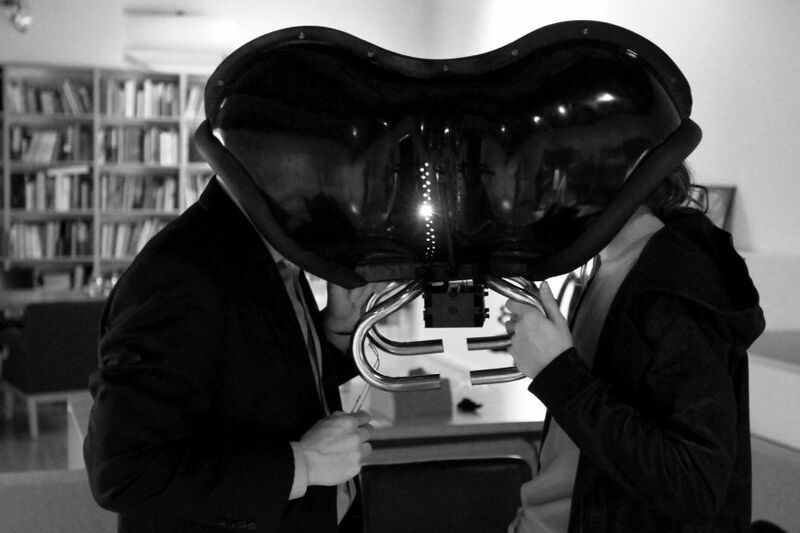 In contrast to commonly used Photoshop algorithms or postproduction compositing techniques, the Mirrorbox is designed to create intimacy, bringing two people within two feet of each other’s physical space to create one constantly shifting, yet engaged reflection. Through a period of prolonged curiosity and design research, the Mirrorbox has developed from a performance work inspired by science into a legitimate scientific investigation. scientific community at the Imagination and Medicine conference, organized by psychologist Dr. Robert Bosnak. The positive response to this phenomenon inspired a deeper exploration of fabrication techniques that have allowed the Mirrorbox to become a robust tool for use in a variety of interpersonal scenarios. Currently, the effects of this artwork are being studied at USC’s Brain and Creativity Institute where the Mirrorbox is being used in a pilot study testing its effects on cultures in conflict.